Stunning scenery, pretty villages, ancient sights, and exciting cities—this budget-minded tour of Britain and Ireland (with Paris) offers all of this and more. Your tour starts in Dublin, Ireland’s fun capital; ends in Paris, France’s exciting capital; and overnights along the way in Killarney, Tramore, Cardiff, and London. ARRIVE IN DUBLIN, IRELAND. Check into your hotel. In the afternoon, there’s time to rest or discover the vibrant Irish capital, and maybe join an optional dinner evening at the Guinness Storehouse. DUBLIN. Meet your Tour Director and traveling companions and start your day in the “Fair City” with an orientation drive along statue-lined O’Connell Street; elegant Georgian squares with their tall red brick townhouses, colorful doors, and wrought-iron decorated windows; Oscar Wilde’s Trinity College; and St. Patrick’s Cathedral. Why not end the day with an optional Irish cabaret evening including dinner, dance, song, and laughter? DUBLIN–GALWAY–CLIFFS OF MOHER–ENNIS. Head for dairy farm country in the center of the “Emerald Isle.” Stop in Galway, a popular seaside destination and a buzzing cosmopolitan center with colorful shops and a busy café and bar culture. Then, cross the glacial-era limestone plateau of The Burren to visit the spectacular 668-foot CLIFFS OF MOHER and enjoy amazing vistas of the Clare coast. Tonight’s optional opportunity: a medieval banquet at a historic castle. ENNIS–ADARE–RING OF KERRY–KILLARNEY. Stop for photos in Adare, one of Ireland’s prettiest villages, beautifully set in woods along the Maigue River, and with thatched cottages lining its wide main street. In County Kerry, join the road known as the RING OF KERRY for a 100-mile coastal panoramic drive. Focus your camera on sparkling seascapes, mountains dotted with brightly colored farmhouses, winding lanes bordered with subtropical vegetation, and views of the Lakes of Killarney from Ladies View. Later, discover Killarney, a town full of history, heritage, and world-class hospitality. Two special optional adventures are available: take a horse-drawn jaunting car along the National Park and later, you might like to join an optional pub tour. KILLARNEY–BLARNEY–TRAMORE. Move on across the Kerry Mountains and through County Cork to Blarney, famous for its magical Stone of Eloquence. You will have time to shop for traditional Irish handicrafts and handmade crystal, or perhaps walk up to the castle. After lunch, drive past Cork, the country’s second-largest city, to Tramore, a charming seaside resort. CARDIFF–BATH, ENGLAND–STONEHENGE–LONDON. Your day begins with a drive across the spectacular Severn Bridge into England. Stop in the elegant Georgian city of Bath, famous for its Roman relics, before visiting STONEHENGE, one of the wonders of the world and the best-known prehistoric monument in Europe. Explore the visitor center with its imaginative exhibitions, then discover the ancient landscape on foot. After arriving in London around 3:30 pm, how about celebrating the success of your tour with a night out on the town? LONDON. Today is for exploring on your own or enjoying our exciting program of optional activities. You may choose to join a Local Guide for an optional morning sightseeing tour of the city’s famous landmarks: the Houses of Parliament and Big Ben, Westminster Abbey, Whitehall’s mounted horseguards and the Prime Minister’s Downing Street residence, Piccadilly Circus, and Buckingham Palace. Later, maybe visit Windsor Castle or the Tower of London with its spectacular Crown Jewels. Tonight, dinner at a traditional pub, followed by a leisurely cruise on the Thames River, would be a fun way to end your vacation! 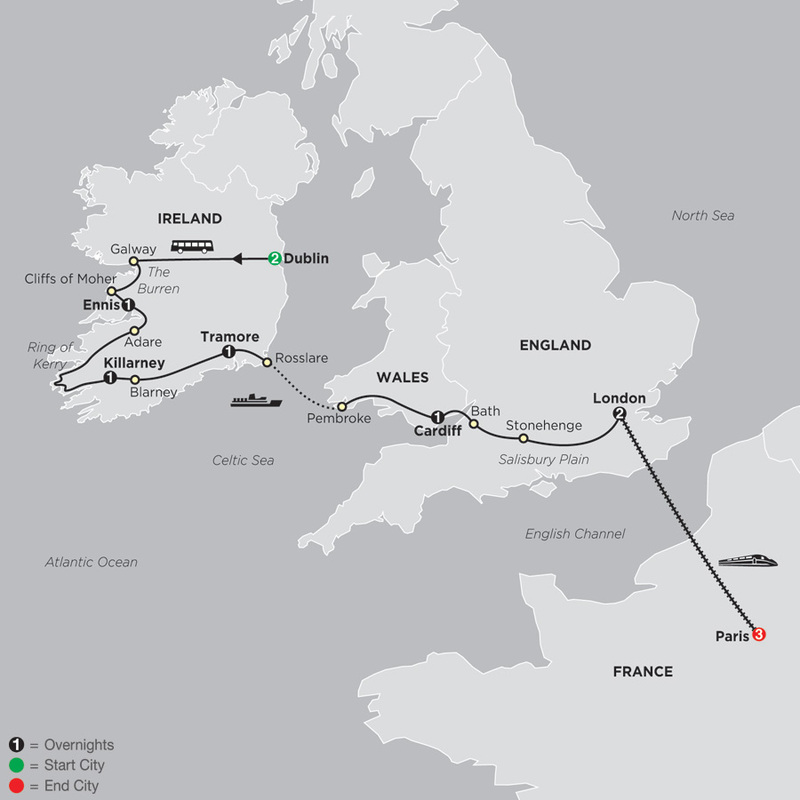 LONDON–PARIS, FRANCE. Travel by high-speed EUROSTAR TRAIN (Standard class) to Paris. Your Local Host is available to help you make the most of your stay. PARIS. Morning guided sightseeing features Paris’ most famous landmarks and a SEINE RIVER CRUISE. PARIS. Your Local Host will have many suggestions for your day at leisure. "What I love most is the magnificent scenery of the British Isles, the pleasure of being able to show travelers evidence of our long and varied history, and the opportunity to meet so many interesting people; both the travelers themselves and the people we encounter at the many stops along the way!"